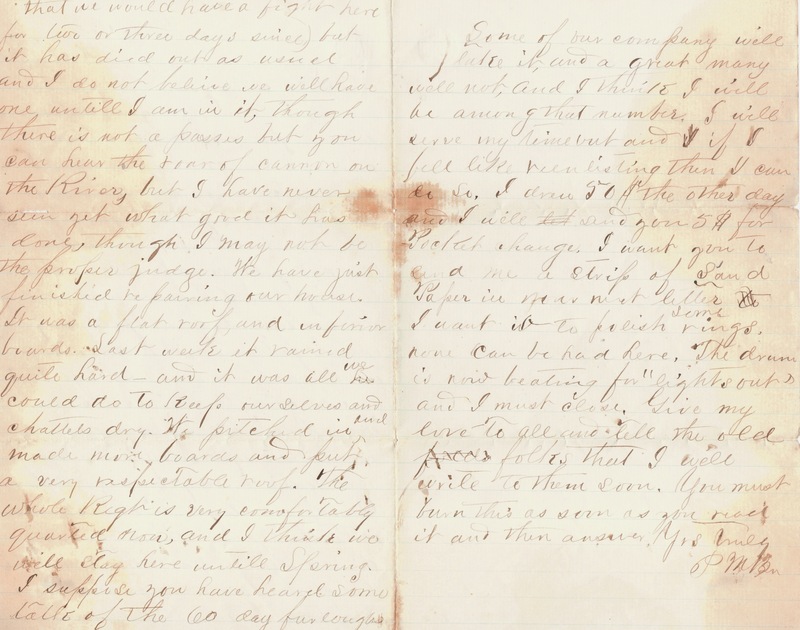 Parham wrote I suppose you have heard some talk of the 60 day furloughs to his sister, Mary, on December 30, 1861. 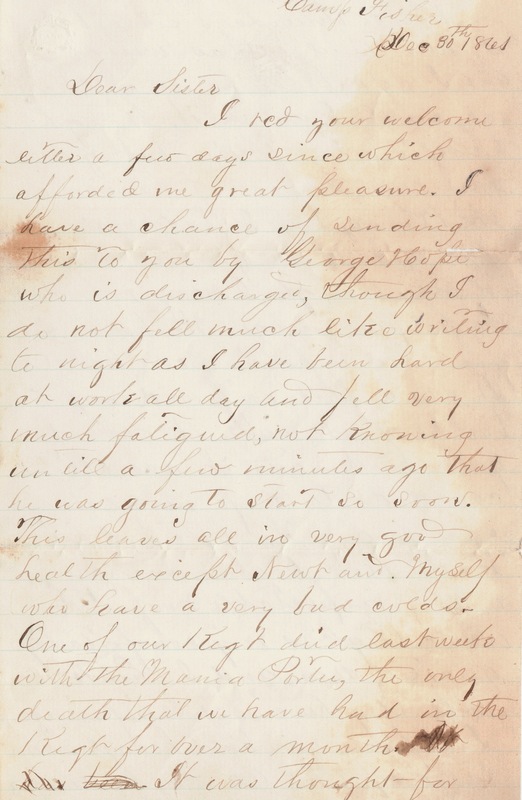 Wrestling with the decision on whether or not to take the furlough, Parham wrote several weeks later on January 21, 1862 that he would wait to hear his parents view on the subject. A Confederate Muster Roll, with Parham’s signature of acceptance, makes it clear that he decided on the matter. Documented in military records, it shows he re-enlisted at Camp Fisher, Va, and furloughed Feb. 10, 1862. The Muster Role also indicates the bounty due was $50 for re-enlisting and that his term of service was extended for two years. Immediately upon re-enlisting, Parham took a brief furlough to visit his family in College Hill, Mississippi. What was it like for Parham during his furlough? Did he sit around the dinner table with family, enjoying every bite of the home cooked meals? Did he sit in the pews of College Hill Presbyterian Church again for Sunday worship service? Did he walk the streets of Oxford and vicinity with friends? Did he contemplate if this would be the last time he would see and experience his childhood home of College Hill? 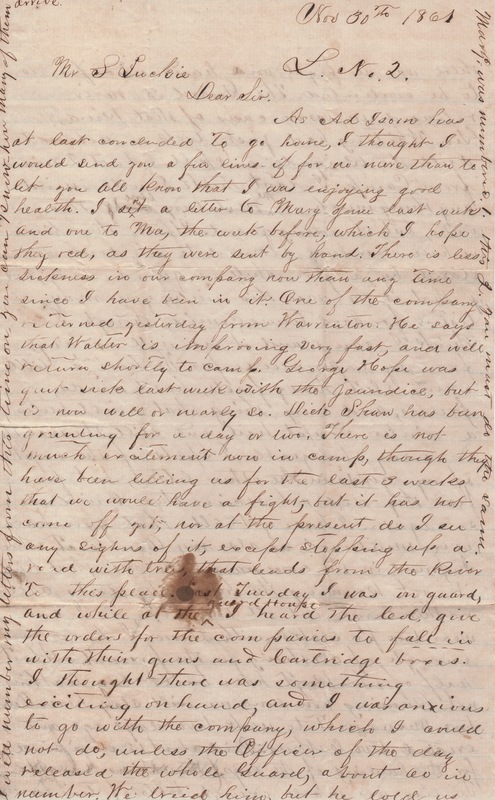 The next blog post will be a letter Parham wrote home on March 31, 1862 about his safe arrival to a different camp near Fredericksburg, Virginia. The Blockade of the Potomac had ended, and the Peninsula Campaign had begun. Sixteen days after writing of safe arrival, the Confederate government passed the Conscription Act, a draft which required all healthy white men between the ages of 18 and 35 to a three-year term of service. The Act also extended the terms of enlistment for all one-year soldiers to three-years, granting the 60 days of furlough to those with extended enlistment terms. I rcd your welcome letter a few days since which afforded me great pleasure. 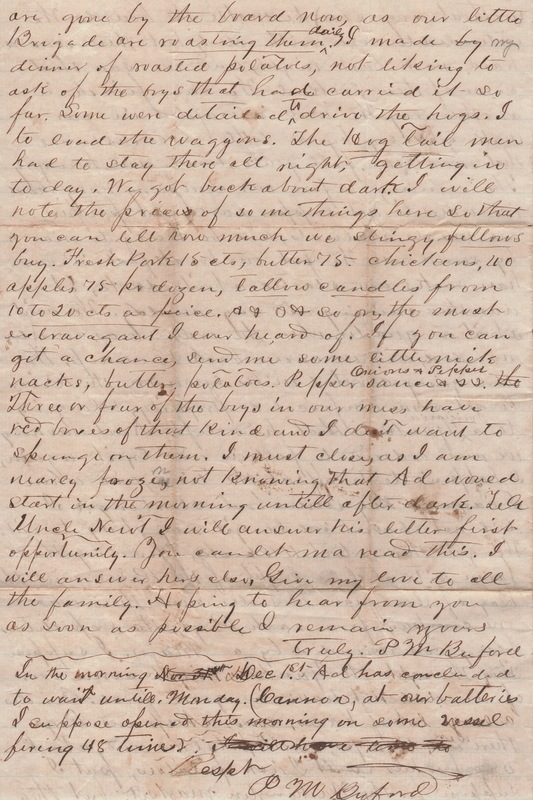 I have a chance of sending this to you by George Hope who is discharged, though I do not fell much like writing to night as I have been hard at work all day and fell very much fatigued, not knowing untill a few minutes ago that he was going to start so soon. This leaves all in very good health except Newt and. Myself who have a very bad colds. One of our Regt died last week with the Mania Portu, the one death that we have had in the Regt for over a month. It was thought for for two or three days since, that we would have a fight here but it has died out as usual and I do not beleive we will have one untill I am in it, though there is not a passes but you can hear the roar of cannon on the River, but I have never seen yet what good it has done, though I may not be the proper judge. We have just finished repairing our house. It was a flat roof, and inferior boards. Last week it rained quite hard- and it was all he we could do to keep ourselves and chattels dry. We pitched in and made more boards and put a very respectable roof. The whole Regt is very comfortably quartered now, and I think we will stay here untill Spring. I suppose you have heard some talk of the 60 day furloughs Some of our company will take it, and a great many will not, and I think I will be among that number. I will serve my time out and I if I fell like reenlisting then I can do so. I drew 50$ the other day and I will let send you 5$ for Pocket change. The drum is now beating for “lights out” and I must close. Give my love to all and tell the old folds folks that I will write to them soon. 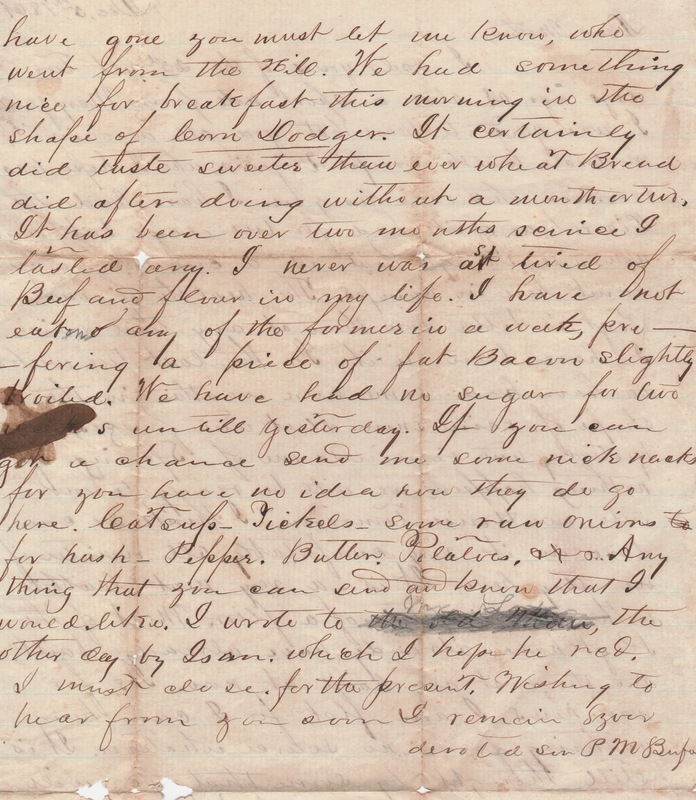 It appears George W. Hope hand-carried this letter to Parham’s family. 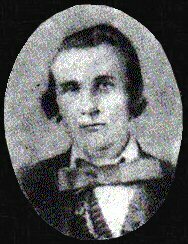 George W. Hope enlisted April 26, 1861. Born in Mississippi, a student, single and 20 years old. 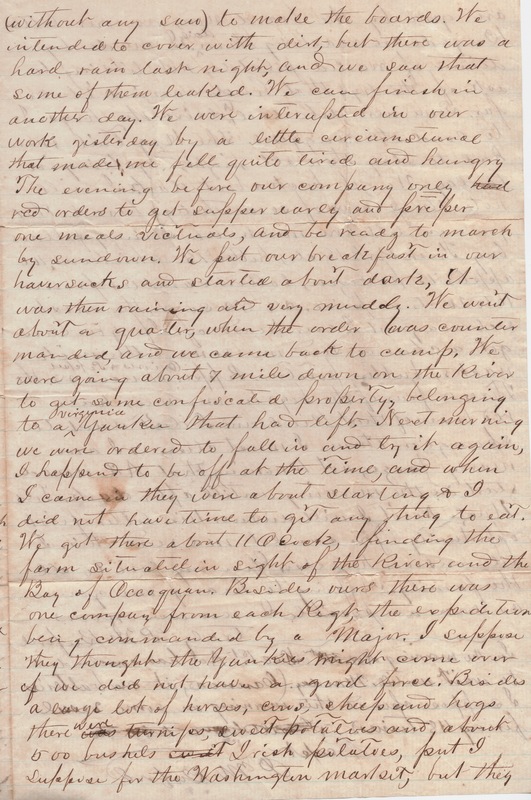 According to Lamar Rifles: A History of Company G, Eleventh Mississippi Regiment, C.S.A., he was discharged…by reason of accidental wound through left wrist. [After recovery he reenlisted in the 30th Mississippi and did gallant service for his country in that command. Was killed at battle of Murfreesboro, Tenn.]. 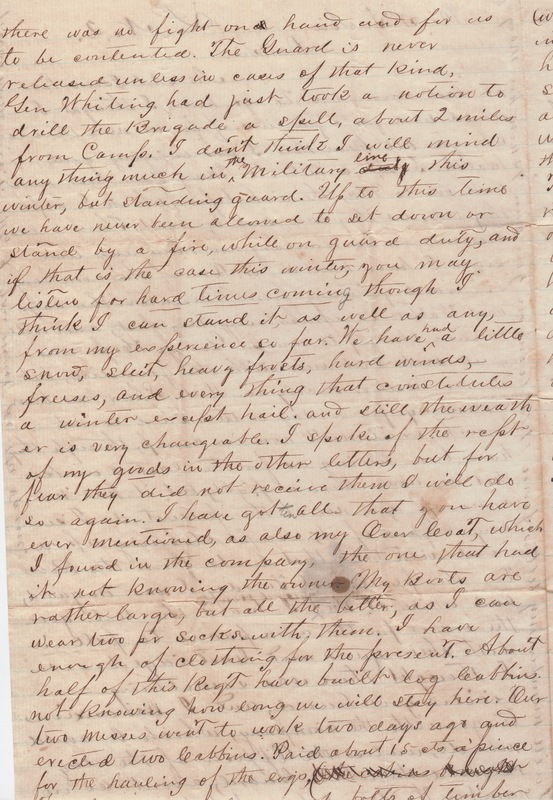 Parham writes one of our Regt died last week with the Mania Portu. He is referring to mania-a-portu, also known as delirium tremens. 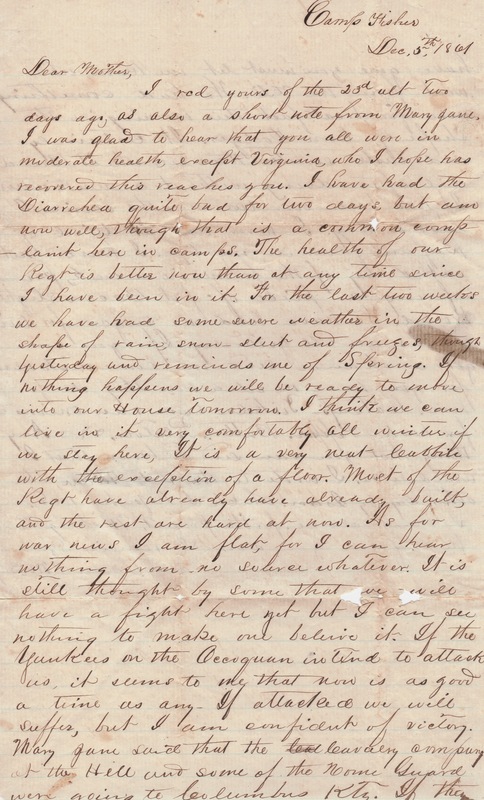 I rcd yours of the 23rd abt two days ago, as also a short note from Mary Jane. I was glad to hear that you all were in moderate health, except Virginia, who I hope has recovered this reaches you. I have had the Diarrehea quite bad for two days, but am now well, though that is a common complaint here in camps. The health of our Regt is better now than at any time since I have been in it. For the last two weeks we have had some severe weather in the shape of rain, snow- sleet and freezes, though yesterday and reminds me of Spring. If nothing happens we will be ready to move into our House tomorrow. I think we can live in it very comfortably all winter if we stay here. It is a very neat cabbin with the exception of the floor. Most of the Regt have already have already built, and the rest are hard at now. As for war news I am flat, for I can hear nothing from no source whatever. It is still thought by some that we will have a fight here yet but I can see nothing to make one believe it. If the Yankees on the Occoquan intend to attack us, it seems to me that now is a good a time as any, If attacked we will suffer, but I am confident of victory. Mary Jane said that the cal cavalry company at the Hill and some of the Home Guard were going to Columbus Kty. If they have gone you must let me know, who went from the Hill. Click image to view recipe for “Gritty Corn Dodgers” by Lorraine Thompson. We had something nice for breakfast this morning in the shape of Corn Dodger. It certainly did taste sweeter than ever wheat Bread did after doing without a month or two. It has been over two months scince I tasted any. I never was as tired of beef and flour in my life. 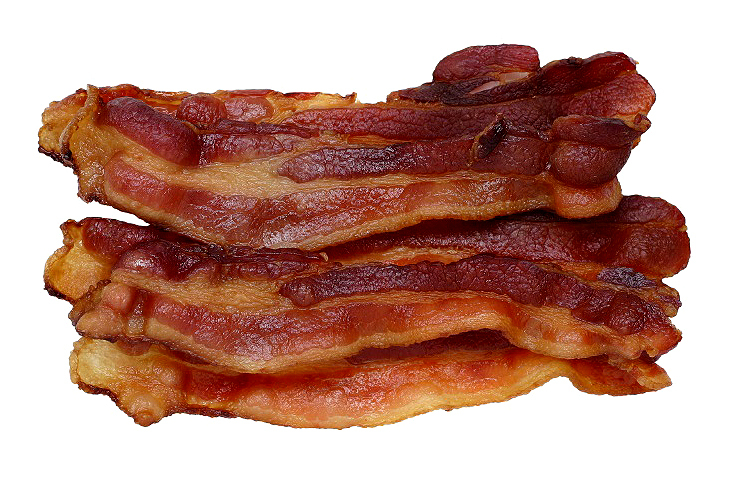 I have not eat(en added in pencil) any of the former in a week, preferring a piece of fat Bacon slightly broiled. We have had no sugar for two weeks until yesterday. If you can get a chance send me some nick nacks for you have no idea how they do go here. Catsup – Pickles – some raw onions for hash – Pepper – Butter. Potatoes, +++. Anything that you can send and know that I would. like.